It really is quite amazing how quickly the time goes by when taking care of a small child. 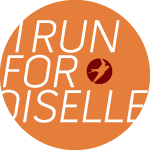 I can only imagine how fast the time will go by when I'm also running and working too! 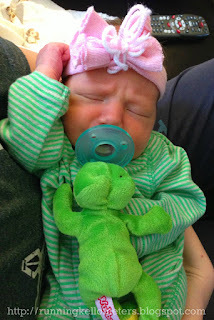 I thought I would put together a list of some of my favorite things from Patsy's first few weeks of life! 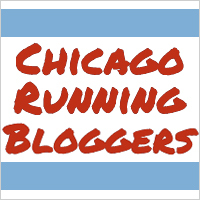 1) Wubbanubs - these came recommended from Michelle at Crazy Running Legs. I saw them and thought they were so adorable, I needed to register for a few. In addition to being adorable, they are pretty functional too. They are much more difficult to lose than the normal pacifier. When Patsy spits it out (which is often), it sits on her instead of rolling onto the floor. 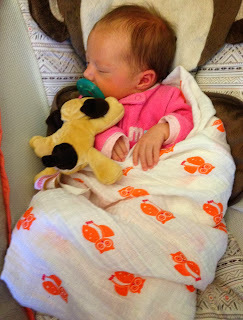 2) Aden & Anais Swaddle Blankets - These were recommended to me by several different folks. I love that they are muslin and breathable. It makes me feel better about using them and the lessened suffocation hazard. They are also pretty large which is great for the novice swaddler. Last but not least, the patterns are absolutely adorable. They are a little on the expensive side but they occasionally go on sale at Babies R Us and are also available on the Kohl's website. I highly recommend you pick up some! 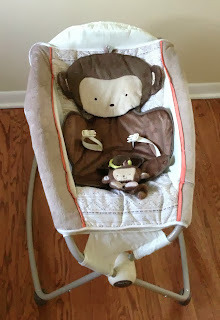 3) Fisher Price Rock N Play Sleeper - This was something that I didn't register for but my SILs bought for me because they thought I would love it. Oh my goodness, this is the best thing ever! It pretty much is a portable crib that is super easy to maneuver around. We live in a ranch and this sleeper is pushed around to the kitchen, living room, bathroom... wherever! I'm so glad we have this little piece of furniture. 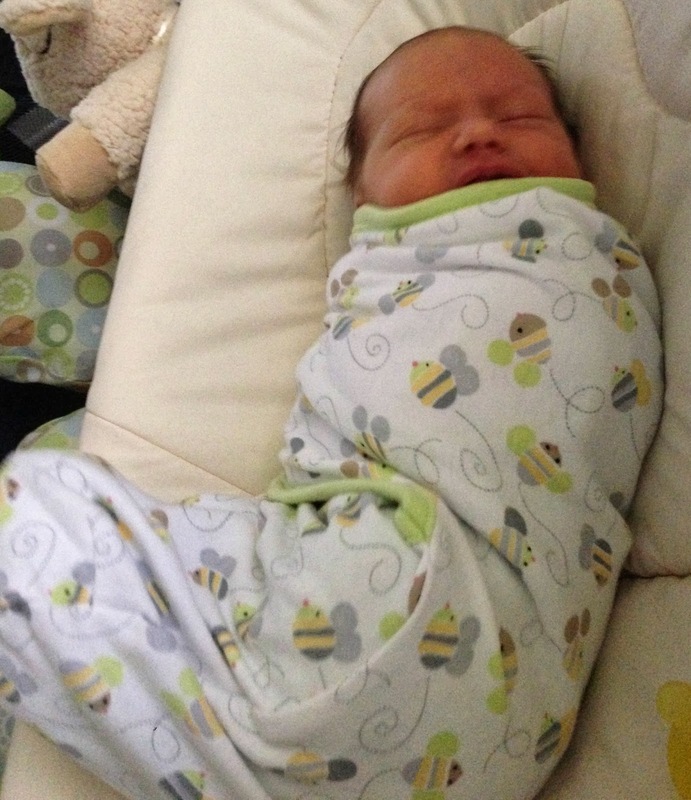 4) Summer Infant Swaddlers - These are fantastic. The nurses at the hospital are able to swaddle your baby for you beautifully. Then you come home and no one in your house has the same amazing swaddling skills. Therefore, the folks at Summer Infant created swaddles that use velcro to keep in place. We put Patsy in them just for sleeping and she loves them. Babies are only supposed to be tightly swaddled for the first few months so I didn't get a ton, just a few. These swaddles are currently available at TJ Maxx and Marshall's stores for much, much cheaper than Babies R Us and Buy Buy Baby. 5) Honest Company Diapers - I heard about this company from a friend and I liked that they had diapers that were plant based and biodegradable. 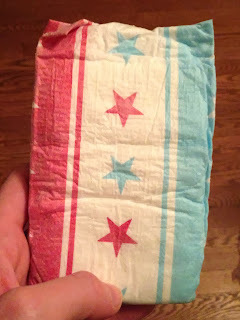 I consider myself to be semi-crunchy-granola and I thought that these diapers were a good fit for us. They are delivered to my house as regularly as I want them to be (and wipes are included in the package). The patterns are also super adorable. The only downside is that they don't come with the blue/yellow line that says whether or not the diaper is wet. As often as she is peeing and pooping, I'm not too worried about it at this point. The company doesn't just do diapers. They also offer cleaning products, baby care products, and even vitamins. All of their products are organic, plant based, and uber-enviro-friendly. And just because, here are some more photos of my adorable baby girl. I might be having a bit too much fun picking out her outfits every day. Headbands are pretty much a necessity. Note: I was in no way compensated for the reviews of these products. These opinions and views are my own. Patsy is so cute! I love that last outfit. I should really do a video on how to do a GREAT swaddle. It really just takes a little practice...although I agree nobody really teaches you how to do it. Thanks! I hope you can use some of these recommendations for your little lady too! I'll email you on plans for a walk! How about Sunday morning? Thanks! The last outfit is my favorite. We got the turtle wubbanub as a wedding shower gift off of Amazon. I couldn't find it at Babies R Us or Buy Buy Baby... Sorry you had to say goodbye to the turtle (I remember that one was your favorite). I'm hoping that she'll get used to the headbands so she will keep them on her head. A girl can dream, right?! I have brunch plans on Sunday AM (around 10:00) but could walk earlier or in the afternoon. I am also off on Friday, if that works better!